The characters in the world of Disney are a lot, they are real, fictional, but any hero or heroine can form the basis of your future unique Disney world photo ideas. Any girl will leap to try on the image of the lovely Belle or the sweet-voiced Little Mermaid, and by the aid of portrait retouch, the faces of the models will get that little cartoon image, and then you can definitely believe that dreams come true! We think that the father of the children's animations Walt Disney needs no introductions; he is the greatest animator ever. If today a new cartoon or film is released under the label of Walt Disney's studio, then this movie is bound to be successful! Sometimes the heroes are not new, but all familiar princesses from fairy tales, the characters from cartoons and skurks. Soon it will 100 years as the young American cartoonist Walt Elias Disney founded the company “The Walt Disney Company”. A small animation studio has evolved over the years into a huge empire that regularly releases new films (not only animated films), but also has its own TV channels and theme parks across the globe. Walt Disney authored for the first time ever the sound, music and animated feature in the history of cinematography, and he is the one who became the “dad” of Mickey Mouse, Bambi, 101 Dalmatians and other legendary characters who left their mark in the history of world cinema. Later, inspired by his ideas, designers and developers have built Disneyland parks all over the world, which attracting millions of tourists and guests from across the globe: such destinations are of interest to both children and adults, everyone wants to put on the ears of Mickey Mouse, ride on spectacular rides and plunge into the tale. And particular Disneyland is the best-loved site for photo shoots and weddings; there are so many Disney photo ideas in the world so perk it up all you want. With each new release of the cartoon or film, the popularity of the photo session in the style of Disney is growing more and more. You will be surprised, but the enthusiasts and creators design such crazy images from the characters: photo sessions can take place in the style of pin-up, horror, the princess in the real world (it was not like in a fairy tale), princesses of different nationalities; many brand designers take ideas from the heroin and heroes outfits to create their collections, also hold holidays and even weddings in the style of Disney cartoons. This variety of images cannot help but surprise! After the picturizing of “Beauty and the Beast” you can safely talk about the global passion for princesses from the Disney cartoons. This is a real trend among artists, illustrators and makeup artists today only the lazy did not create their vision of Disney fine art photography or a photo project demonstrating how these princesses would look in real life. It turns out differently: somewhere more successfully and beautifully, and somewhere even scary. Before we start with a bright professional photo shoot, where the celebrities took part, we will tell you about the beautiful Disney heroines. Let's look at the most stunning heroines that were remembered and conquered the whole world, because it is their images, and not some princes, that are used for photographs. 1) Snow White is deemed the main Disney princess and has her own star on the Hollywood Walk of Fame. This princess gains the Disney’s heart many years ago, when he saw as a teenager the mute short film adapted from the Brothers Grimm’ tale. It's no surprise that he dedicated this first major project to this dear heroine. The film “Snow White and the Seven Dwarfs” in 1937 was the first full-length animated cartoon by Disney. And today the plotline of this fairy tale is used in different movies and stage shows, photo shoots and sketches of various kinds. 2) Cinderella. The metamorphosis the mice into stallions and rags into the Cinderella's ball gown was indeed a real magic in the world of animation. For these wonderful effects, the film “Cinderella” in 1950 was awarded the “Golden Bear” the highest award of the Berlin Film Festival. And in 2015 it eas released a fantasy film, which was a remake of the eponymous cartoon. Every girl is a little Cinderella, who dreams of a glass slipper and of the Prince Charming. 3) The Little Mermaid. The redhead Ariel is the only one of princesses of the “inhuman” origin. Initially, the animators wanted to make the heroine a blonde, but eventually stopped on the red hair color: the green tail contrasted well with it. In general, Ariel has two prototypes: the mermaid from the Andersen’s fairy tale and the actress Alyssa Milano the main animator was oriented on her appearance. 4) Sleeping Beauty. The plot of the enchanted beauty is the favorite of many. In the film “Sleeping Beauty” in 1959, music from the same name ballet by Pyotr Tchaikovsky is used, in interiors there are references to medieval tapestries, and the prototype of the castle was Neuschwanstein, the castle of the Bavarian king Ludwig II. The image of the castle from the “Sleeping Beauty” became the emblem of Walt Disney's studio and the thematic center of all the world's Disneylands. 5) Belle. The film “Beauty and the Beast” in 1991 became the first cartoon-nominee for “Oscar” in the nomination “Best Film”. And it was Belle who became the first of Disney's princesses, whose image was relived in 3D, probably this is one of the most trending Disney world picture ideas. The updated version of the cartoon was released in 2013 and this year there was a romantic film “Beauty and the Beast”, wherein the main role was played by Emma Watson. 6) Jasmine. The following year, after the showing of “Beauty and the Beast” in 1992, the animated cartoon “Aladdin” appeared on the screens, the comedian Robin Williams took part in it and voiced Jinn. Princess Jasmine, of course, was criticized by the Islamic world for being too open a costume, which, by the way, on the official poster of the film is green, not blue, as in the film. 7) Pocahontas, unlike other princesses, is a historical character. The prototype was the Indian princess Mataoka, nicknamed Pocahontas (which translates as “Little Wanton”). The history of the princess has acquired legends and unreliable details, but the main result is a cartoon. 8) Mulan is another brave beauty of Asian origin. For the basis of the movie “Mulan” of 1998 (name, by the way, means the flower magnolia), the creators took a medieval Chinese poem about brave Hua Mulan a woman who joined the army instead of her elderly father. 9) Rapunzel. The long-haired blonde Rapunzel is the tenth anniversary official Disney’s Princess, and the movie “Tangled” of 2010 became the 50th full-length animated film studio and the most high-priced: the production cost $ 260 million! The film about the beauty with a long plait of hair inspired ten women from the creative group to grow hair, which after were given to the production of wigs for people who were bald as a result of diseases. 10) Merida. Bravehearted Princess Merida of Scotland is the last for today the official Princess of Disney. She became the first heroine of the Pixar studio (which also took part in the production of the cartoon), included in the same line with the rest of the princesses. The solemn dedication of Merida to the princess took place in May 2013 at the Walt Disney World Park in Florida. Do not forget to mention a few male characters who have distinguished themselves by character and can become the basis for men's Disney photo ideas. Aladdin and his Jinn. As the creators of the film admitted, initially with the image of Aladdin there were problems: no one clearly could not imagine how he should look at all. As a result, the hero appeared older than expected, and the design of the wide Oriental bloomers of Aladdin was borrowed from the American rapper MC Hammer. The former thief from Baghdad made a worthy company: he is in love with Princess Jasmine, and in adventure he is helped by a jolly Jinn, the monkey Abu and an avid Yago parrot. And, perhaps, for the sake of laughter for the idea, you can take the image of the Mickey Mouse and drake Scrooge McDuck. McDuck drake-millionaire is the embodiment of the American dream: having emigrated from Scotland, poor Scrooge built an entire empire in the USA. Now his money is safely hidden in a special depository, and drake with pleasure “bathes” in his coins. McDuck is also a regular participant in the ratings of the richest fictional characters according to Forbes magazine. And the brainchild of Walt Disney is Mickey Mouse. This mouse became the mostbig-name hero of Walt Disney and the symbol of his film company (and the whole of American culture in general). Mickey has a friend Minnie Mouse and a dog Pluto; also the mouse is friends with the drake Donald Duck. These images have become symbols and the main association when it comes to Walt Disney: the costume details and cute muzzles have become an integral part of Disney fine art photography especially at Disneyland. And now, when we looked at the main characters of the cartoons, let's move to thematic photo shoots in this style. The fairy-tale-ish theme is gaining traction in the modern fashion photo. Firstly, it gives an opportunity to try on the image of an all-powerful wizard or a raving beauty, which is often impossible in ordinary life. Secondly, fairy-tale photo shoots combine children's integrity and adult eroticism, which always attracts. Thirdly, photos based on fairy tales are very colorful and beautiful they cannot be torn off. We present to you the Master for creating fabulous photo shoots - American photo artist Annie Leibovitz. On her account there are dozens of amazing magic photo sessions with the participation of the brightest stars of show business. Photo session "Beauty and the Beast" with Drew Barrymore for “Vogue” magazine is the work of the talented Leibovitz. These images are a field of activity for various Disney photo shoot ideas, so no photographer bypasses this image and the famous cartoon scene. In this interpretation Drew, of course, appeared in the image of Beauty, and the role of the Beast was performed by a real lion. The evil sea mistress Ursula from “Little Mermaid” was very effectively played by Queen Latifah. 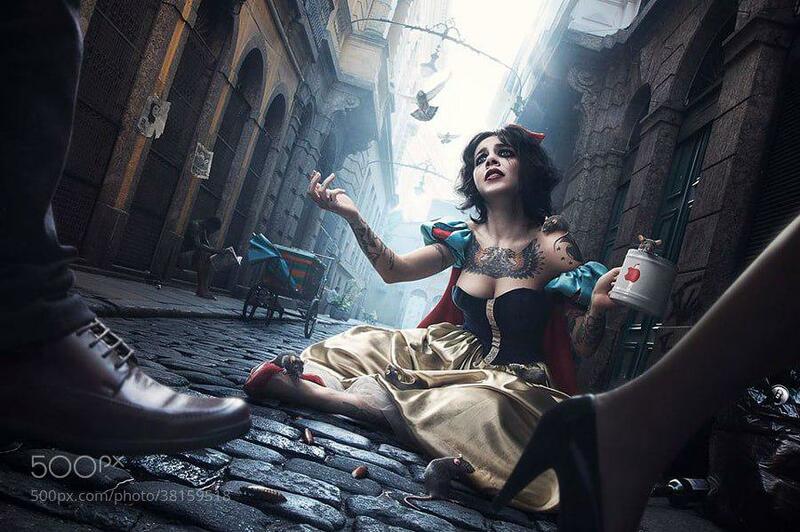 The photographer shot the most beautiful girl in the world, Rachel Weiss in the image of Snow White. A famous actor Alec Baldwin appeared in the image of a mirror, which corresponded to Olivia Wilde, that she was the most beautiful in the world. And the Prince Charming was embodied by the famous football player David Beckham. It was fortunate enough to work with Leibowitz and Jennifer Lopez with her ex-husband, Marc Anthony. Thanks to the costumes of Jennifer and Mark and the flying carpet, the picture turned out really fabulous. Another Disney character Cinderella played Scarlett Johansson; Annie photographed Scarlett when she was late home from the ball. The photo turned out deep, outlined and storybook. Annie Leibovitz’ creativity was not without the most popular fairy tale theme the work of Lewis Carroll “Alice in Wonderland”. In the role of Alice – Russian model Natalia Vodyanova, and the images of other characters of the fairy tales embodied the most talented and popular designers of our time. For some pictures, the photographer used the before and after retouch effects to emphasize the childish features for completeness of the image on the face of the model. In another Leibovitz’ photo series, the image of Alice tried on Beyonce. A series of photographs was created specifically for the advertising of “Disneyland”, and many celebrities considered it an honor to be invited to this shooting. And again, “Alice in Wonderland”, the most mysterious and modern photo shoot. This time is in the performance of Amanda Seyfried. In the photo, Amanda does everything that is supposed to be the real Alice: she paints roses in red, plays croquet with the help of flamingos and is surprised at everything she saw. And all this in a modern metropolis. Therefore, it will even surprise you! Let's talk about the expensive unique Disney world photo ideas, which were embodied by the wedding photographer from Vancouver, Amrit Greval. We already wrote above that weddings and all kinds of cosplays for thematic parties or any kind of photo shoots are the leading places, even “Cosplay Photoshop tutorial or how to make your favorite character's impression?” appeared on the Internet. But back to the most luxurious photo shoot, which budget exceeded tens of thousands of dollars. The inventive Amrit Greval took on the creation of a series of unusual images that should reflect the entire enchantment of the Disney princesses dressed in Indian wedding attire. He took the nine brightest images of Disney princesses, whose outfits were adorned with even real diamonds (the ornament of the Rapunzel’s plait of hair), and the cost of the Sleeping Beauty dress was $ 10,000. But it turned out luxuriously and simply superb, like the richest Indian wedding. By the way, such photo sessions with Indian motifs are quite common, for example, we can pay attention to the fact that in the outfits of the Pocahontas character there is a combination of Indian patterns, and the Mulan outfit originates from Asian patterns and Indian embroidery. How much do you like cartoons? Especially if it's Disney's cartoons? Perhaps, each of us will have at least one Disney cartoon, which we are ready to watch dozens of times. But sometimes the love of animation leads to a very unexpected, but sweet and romantic experiments. And such experiments find their display in thematic photo sessions. The most important thing in these thematic photo shoots is careful thinking over the image, costume, furnishings and props, you need to think through all the details and trifles, otherwise the Photo color correction services will help to emphasize the entire color range of the images. All the props and similar services can be found on the Internet or in specialized workshops, in the arsenal of some photo studios there can be dresses of Disney characters. It is hard to come by a person who did not watch the popular Disney’s cartoon “101 Dalmatians”. An imaginative couple from state Illinois, USA, risked using the plot of the cartoon to create their betrothal photo session. In 2009 Tony Collet and Corinne Jones met at the Illinois University, and graduated it the two together went to the company “Walt Disney World”. Corinna considers herself to be one of the most dedicated 101 Dalmatian fans, and so she invited her sister Melissa Biggerstaff who is photographer to make a themed photo shoot for them with Tony in the style of this cartoon. The roles of the illustrious Pongo and Peddy in this original project were played by the dogs of the young couple Muka and Isabella. The dogs were beautifully involved in the process of photographing, although they were not Dalmatians. By the way, as an idea, you can create a photo session exclusively for your pets, read more tips and ideas in the article “Pet Photography Ideas From Popular Photographers”; you will be pleased not only with pictures of your animals, but the process itself. The result of the photo session was simply stunning it instantly conquered the Internet. And appreciate this lovely romantic photo story too. 2. We have already talked about fashion princesses, Indian heroines, now the turn came to the sweetest and the most gentle creatures that grow on these fairy tales and believe in them Disney photo ideas, reflected in children's photo sessions. Camillia Courts is not just the mother of a 7-year-old girl, but a talented photographer. Therefore, to solve any problems, this woman is very creative. When Camillia's daughter, Laila, went to first grade, the happiness of the young mother was unlimited. But with joy the family faced many difficulties, one of which was the excessive shyness and isolation of the child. To help the baby adapt, Camillia decided to create an unusual and fabulously beautiful photo project using Disney world picture ideas. Therefore, mom-shooter Camillia Courts decided to entice her daughter Laila with cosplay to bring out of her shell. Camillia bought the girl a luxurious dress and dressed her for a photo shoot as a princess. The result surpassed all expectations! Laila liked being a princess so much that since then she and her mother have become real cosplay fans. And, we must admit, their images of Disney princesses are in no way inferior to the originals, and sometimes even surpass them! Each month the girl tries on the image of a Disney princess or a famous superhero, and Laila's transformations are fixed by her mother on the camera. Thus, the photo archive of the Courts family was replenished with dozens of beautiful photographs that make us believe in magic. The pictures are placed by the creative mom in the Instagram-account, to which more than 40 thousand people are subscribed. Camillia says that such an unusual experiment made her daughter self-confident the girl became more sociable, no longer afraid of cameras and just loves to receive compliments from others. And that the child was comfortable, the active mother also takes part in the photo sessions. At the same time, all the costumes are created by the woman herself. In her microblog you can find many pictures on which she poses with her daughter. Looking at this beauty, you can truly believe in the existence of princesses and fairies! 3. Another fairy story, which was embodied by the father, and pluralistically the photographer, George Rossi for his 3-year-old daughter, a photo shoot in the style of the Disney cartoon “Beauty and the Beast”. George took the fundamental approach: during his holidays in Europe, the photographer took pictures of the castle Neuschwanstein in Germany, which served as a backdrop for the fabulous staff. In addition, George and his wife made bespoke suits for Nilly in the style of a fairy tale. To take part in unusual photo sessions to a three-year-old girl is not the first: George arranges for the baby interesting shooting for every major holiday, so that earlier Nilly had already tried on the images of the Little Red Riding Hood and Wonder Woman. At the same time Rossi decided to capture the daughter in the image of Belle, since in childhood he himself was very fond of “Beauty and the Beast”. The resulting photos delighted not only the little darling, along with thousands of viewers around the world. George Rossi hopes that these unique Disney world photo ideas will inspire other fathers to spend more time with their children and make them truly happy. 4. Another talented American photographer from Louisiana Savannah Kate Bridges embodied famous scenes from cartoons. For her Disney world picture ideas, she involved again the little beauties, who are very similar to the heroines of the cartoons, and using Photoshop and other Photo post production services, she managed to really play around this fairy tale story. Savannah Kate, like any child, adored fairy tales, and with the help of photography she showed how she sees this world, she finds an escape in creating different kinds of pictures. Enjoy and you the talents of this girl. 5. As an idea for a photo shoot, you can consider the most unusual Disney character the Little Mermaid. Subjects of filming oblige to hold a photo session on the shore of the pond or in the studio with the appropriate entourage. Often, photographers make a choice in favor of natural landscapes, because in addition to the shore and a pond, you can experiment with tree branches, large stones and sand. The most common attributes for these photo sessions are algae, flower bouquets, wreaths, large fishing nets, seashells that can be used as clothing items, boats, large jewelry and, of course, the tail of a mermaid. It can be made independently, sewing from a fabric of green, blue or silvery color. But even without this accessory you can get by if the portrait or model is in the water to the waist. Particular attention should be paid to the makeup of the eyes. All shades of blue and green will be appropriate. You can add sparkles or glitter. Do not worry if the water slightly spoils the makeup. In a photo shoot of this subject, a light blurring of the makeup is welcome, and the grossest mistakes can then be removed using Headshot retouching. With regard to styling, the preference is to give loose hair. Wet strands that adhere to the cheekbones give the girls even more charm and attractiveness. Unbelievably spectacular will look girls with hair curling and painted in red. Positions for the model-mermaid should be such that the girl felt comfortable and relaxed. You can shoot a model lying on her stomach or back or recreate the most popular scene from the cartoon, where the Little Mermaid is sitting on a rock, but the poses standing in the concept of a photo shoot in the style of a mermaid do not fit. 6. The image of Snow White from the fairy tale of the Brothers Grimm and the filmized story “Snow White and the Seven Dwarfs” is very popular. You can find on the Internet a lot of pictures about different Disney photo shoot ideas, but it's better to think through the image yourself and wheel out your fantasy. Which is better to choose clothes for a photo shoot in the style of Snow White? Disney’s Snow White is dressed in a gown in red-blue-yellow color gamma with a white stand-up collar, a cape of blue or black, with a red lining, and is shod in boots with heels decorated with bows. The main attention should be paid to recognizable elements and details. Singing is not necessary. Now you need to think through the details of the props, you will certainly need: a mirror in an old frame, a ruddy apple, a basket or a vase with apples, a comb, gnome figures, birds, flowers, trees, a lantern, a drape cloth, a wooden chair, a wooden bed and window and fog. Make-up and hairstyle. Snow white is white, like snow, blush, like blood, black as ebony. Make-up in the style of Snow White: porcelain skin, bright cheeks and lips, black eyeliner and mascara. Hairstyle: black slightly curled hair or wig, possibly collected scarlet ribbon, bandage or rim with a bow. You can study our photo editing prices on our website, send us photos and we will with great pleasure retouch your photos, highlight the face and emphasize the main entourage, so as not to spend much time on the make-up and organization of the set. The image of Snow White is suitable for both young girls and adult girls, the main thing is that modesty, kindness, and romanticism and naivety are displayed in the poses and image of the model. What can we say, the characters in the world of Disney are a lot, there are real, there are fictional, but any hero or heroine can form the basis of your future unique Disney world photo ideas. Read fairy tales, watch cartoons, get inspired and always leave place for a dream. They tend to come true.